Matthew Morris is a writer, tour guide, and all-around storyteller living New Orleans. His work often confronts the complexities of memory, sexuality, and the nature of storytelling. In addition to his own prose, he is currently collaborating on two projects: a one-man play and a long form comic. The chronology of The Legend of Zelda series is a source of great debate among fans, who have created several potential timelines, most involving three divergent realities in their convoluted attempt to incorporate every game. Even articles that discuss the timeline logistics in earnest acknowledge how absurd the undertaking is (Jackson 2017). Nintendo developed each game without planning an inclusive timeline, yet this fervent fan speculation prompted Nintendo to release a “definitive” timeline in the 2011 collector’s book Hyrule Historia (Aonuma et al.). The fact that the most recent release in the Zelda series – 2017’s Breath of the Wild – has no evident place in these timelines draws renewed attention to their inadequacy. In light of this, I propose an alternative that offers a more organic bond than post-hoc timelines: regarding each game as a folkloric variant of one story, a fictional culture’s rendition of the Hero’s Journey. Myths and folktales are rooted in an oral tradition, subject to the fluidity of memory, changing cultural standards, and the style and intent of each storyteller. These stories exhibit disparities that become more and more pronounced as they pass through time and cross cultural boundaries, like a centuries-long game of telephone. This results in stories that are specific to one culture while bearing a close resemblance to stories from other countries. Even within a single culture, one might find several different versions of a story. Names, customs, and plot details may vary dramatically while certain structural motifs, moral lessons, or stock characters remain firmly intact. Thus, successive storytellers may change a character’s name from the Italian Petrosinella to the French Persinette to the German Rapunzel, but she always lets down her extravagantly long hair to facilitate her rescue, and women improvise ladders with their hair in Persian and Philippine folktales as well (Ashliman 2015). In fact, folktales around the world share so many tropes that folklorists have developed systems for cataloguing them, most notably the Aarne-Thompson classification systems, which designate Rapunzel and her ilk as ATU 310, The Maiden in the Tower (Aarne et al.). Many folklorists attribute such widespread similarities to a common antecedent, but scholars still debate that stance. An analogous phenomenon occurs in The Legend of Zelda series, which adopts one of the most universal narrative paradigms, what Joseph Campbell called the ‘Hero’s Journey’: the protagonist has greatness thrust upon him and must face many trials, culminating in a confrontation with a terrible force (Campbell p. 23). While antecedents in folklore are difficult to trace, The Legend of Zelda has an unmistakable one: the original game, which tells this story in its simplest, most archetypal form. Every subsequent game has offered its own interpretation of that archetype. Each game has distinct differences, and some diverge significantly from the primary myth, but they are all ultimately variations on the original’s ‘Hero’s Journey’ theme. To be clear, I’m not suggesting that Nintendo envisioned the series this way; I’m saying that the games adopted this form naturally. The very title, The Legend of Zelda, reasserts this interpretation. Every game shares that title, accompanied by a descriptive subtitle. Note that they are not called The Legends of Zelda; it is one legend, retold in many ways but sharing motifs, narrative structures, characters, settings, and modes of gameplay. By describing this web of associations, I will illustrate how the games are not linked by a coherent timeline but by a network of hereditary traits. Despite the series’s misleading title, the protagonist Link is the only character who appears in every game. According to series creator Shigeru Miyamoto, the original game “was to be set in both the past and the future and as the main character would travel between both and be the link between them, they called him Link” (Audureau 2012). But the name is laden with significance. He is the link between the players and the game, and one of the few elements linking every game, and ergo every legend. While his story may vary, his essence is immutable. Link is always either a child or a young man living under unassuming circumstances. He begins his adventure at the compulsion of external forces and shoulders this burden without protest. In several games, they call this his destiny, and it is often prophesied. Link never speaks in any of the games, making him both an enigma and an empty vessel that the player is meant to fill. He seems to come from nowhere, and once his quest is complete, he returns to nowhere. This lack of identity blurs all of the Links together, making them more identifiable as an enduring and recurring archetype rather than individual characters with distinct personalities. Link’s role is bound to the Triforce. 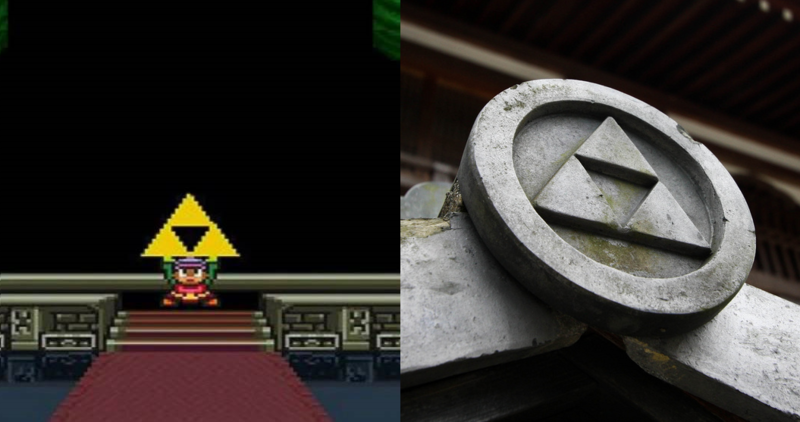 This symbol is central to the plot of several games, adorns architecture throughout Hyrule, and has become integral to Nintendo’s branding. Due to its prevalence, the Triforce has taken on a life outside of the game: it has appeared in home decor, merchandise, and tattoos, which speaks to its sheer iconic power. Its elegant simplicity and resemblance to other ancient iconography gives it a mythic resonance (it is modeled after the crest of the Japanese Hōjō clan) (Plunkett 2011), and in the story it is tied to the world’s creation myth and the struggle between good and evil. Its tripartite form invokes the magic of threes. The number three is a common structural motif in folktales, as seen in the Three Little Pigs and Goldilocks. More significantly, many religions feature triad divinities, like Brahma, Vishnu, and Shiva, or the Father, Son, and Holy Spirit. The Triforce is a relic left by the three goddesses who created the game’s world, but it also embodies the three central characters. Zelda and Ganon feature prominently throughout the series, though they do not appear in every game. As characters, they are more fully drawn than Link, with spoken dialogue and distinct personalities that change between games, but these changes are superficial. They too are destined to realize their allotted roles in the Triforce drama. These roles are tied to stock types found in folktales. Zelda is the damsel in distress who Link must rescue, but she also subverts this trope by acting as Link’s ‘donor’ (Propp p. 39): he could not succeed without her aid (for more on this see Propp’s dramatis personae). As the antagonist, Ganon represents the perpetual cycle of chaos and destruction, but his exact form changes frequently. He combines many mythic archetypes — thief king, sorcerer, warlord — and resembles a demon or a vampire, a figure one can subdue or seal away but never truly kill. He recalls malevolent deities like Balor in Irish folklore and, in his porcine form, bestial hybrids like the Minotaur. While Link, Zelda, and Ganon comprise the heart of the series, The Legend of Zelda has a huge cast with several recurring characters. Some have important parts, like Impa, the King of Hyrule, and the Great Deku Tree, who perform a donor role similar to Zelda (Propp p. 39). This suggests that their fates are entangled with the Triforce drama, and perhaps they are reincarnated as some fans believe Link and Zelda are. Yet this doesn’t explain the recurrence of characters like Tingle, Beedle, Dampé, and Biggoron, who mysteriously manifest again and again in radically different worlds and epochs though they have little-to-no bearing on the plot. The characters mentioned so far have personalities and roles that largely remain intact between games, but Nintendo recycles characters and character tropes very liberally. As a minor character in Ocarina of Time (Nintendo 1998), the Happy Mask Salesman is cheerful but prone to mood swings; playing a key part in Majora’s Mask (Nintendo 2000), he is far more cryptic and sinister (and shares the same laugh as the villain Vaati). Malon and Talon appear in several games, but they parallel Marin and Tarin in Link’s Awakening (Nintendo 1993), and the brothers Malo and Talo in Twilight Princess (Nintendo 2006) have nearly identical names. Some characters in Ocarina of Time (Darunia, Saria, Mido, Nabooru, Ruto) are named after towns in The Adventures of Link (Nintendo 1987). This network, in which characters and their traits become intertwined and occasionally indistinguishable, suggests a fluidity of identity, one dictated by Nintendo’s proclivity for allusion, fan-service, and the re-use of assets, but whose side effects create an unusual impression: the transmutation of worlds and stories, as if previous games were thrown into a blender and turned into something new. This recalls the treatment of characters in folktales, who may change names, genders, or roles as the story adapts to cultural shifts. In a Greek variation of the Cinderella story, the protagonist is a boy named Cinderello. Some versions of Red Riding Hood have a woodsman who saves the day, while others do not. Character is subjugated to the needs of the story, which is influenced by each culture’s values. This phenomenon is apparent elsewhere in the Legend of Zelda series. There are several distinct races of NPCs: Hylian, Goron, Zora, Rito, Gerudo, and Kokiri/Koroks. Koroks and Kokiri are forest spirits and children of the Deku Tree, but Kokiri resemble children and Koroks are more evidently spirits, in the manner of dryads. In Wind Waker (Nintendo 2002) the Rito evolved from the Zora, but in Breath of the Wild (Nintendo 2017) the two races coexist. Nintendo’s depictions of these cultures, and Nintendo’s approach to world building in general, borrows heavily from traditional folk cultures, highlighting the influence of folklore on the series. The all-female race of Gerudo are based on Amazons from Greek mythology, though Nintendo couches them in an Arabic aesthetic. The beloved horse Epona is named after the Gallo-Roman goddess Epona, protector of horses. The jeweled currency, rupees, takes its name from India’s currency; the prevalence of fairies is indebted to Celtic folklore; stories told in-game are accompanied by illustrations reminiscent of folk art. Nintendo mixes and remixes these cultural influences, so races and locations resurface in multiple games but with changing traits. Hyrule itself is a malleable world molded by Nintendo’s caprices. While it retains familiar locales (Hyrule Castle, Death Mountain, the Lost Woods), Nintendo rearranges the geography to their whim, and technological advances have expanded the scale of Hyrule considerably. Breath of the Wild‘s Hyrule dwarfs every previous iteration of the kingdom. It’s worth questioning why fans seek chronological continuity in the series but seem unperturbed by this disregard for geographic consistency. Certainly references to Lon Lon Ranch and Princess Ruto in Breath of the Wild encourage fans to draw connections to Ocarina of Time, but perhaps it’s better to read these as allusions. If each game is a story told by a different storyteller, maybe these references are the vestiges of a previous telling that was otherwise forgotten. The absurd apotheosis of timeline fever: trying to cram every non-canonical tidbit of Zelda ephemera into one timeline can be seen at the following link: MiloScat: Zelda Timeline: Stupid Version. Folktale variants occur when stories diffuse between countless people over long periods of time. Yet The Legend of Zelda series was developed by an overarching intelligence in the small span of 32 years. Why such striking similarities? Though governed by different forces than folklore, the variants in The Legend of Zelda still reflect changes in time and teller. Though Nintendo designs the games and Miyamoto always has a hand in the process, the director and staff change regularly, and they have to adapt to audience expectations, new technology, and the competitive demands of the market. Nintendo has to create games that offer something new (to sustain interest) while sticking to something familiar (to capitalize on their branding). This dynamic balance contributes to the variations we see in the original formula. Every game operates within the confines of the “Legend” while striking into uncharted territory, formulating new possibilities within a familiar framework. Rather than featuring a single Link who goes on multiple adventures, Nintendo preferred to tap into a more mythic current, to evoke the legends that color our collective unconscious. So why this impulse to force rigid narrative logic on something that defies that logic? It makes more sense to take these stories in the same spirit as the stories that inspired them and to which they pay homage. It frees fans from the absurd task of jerry-rigging a timeline, frees Nintendo from imposing continuity on a series that benefits from narrative flux, and encourages players to appreciate the nuances of Nintendo’s development methods. Aarne, Antti, Stith Thompson, and Hans-Jörg Uther. “Aarne-Thompson-Uther Classification of Folk Tales.” Multilingual Folk Tale Database, . Aonuma, Eiji and Akira Himekawa. The Legend of Zelda: Hyrule Historia. Nintendo/Dark Horse Comics, 2011. Ashliman, D. L. “Rapunzel, and Other Folktales of Aarne-Thompson-Uther Type 310.” Folklore and Mytholoy: Electronic Texts, 30 January 2015. Audureau, William. “Miyamoto, La Wii U et Le Secret de La Triforce.” Gamekult, 1 Nov. 2012. Campbell, Joseph. The Hero with a Thousand Faces. Princeton University Press, 1949. Jackson, Gita. “Breath Of The Wild Doesn’t Fit Anywhere On The Zelda Timeline.” Kotaku, 10 March 2017. Nintendo. The Legend of Zelda. Nintendo, 1986. Nintendo EAD. Breath of the Wild. Nintendo, 2017. Nintendo EAD. Link’s Awakening. Nintendo, 1993. Nintendo EAD. Majora’s Mask. Nintendo, 2000. Nintendo EAD. Ocarina of Time. Nintendo, 1998. Nintendo EAD. Twilight Princess. Nintendo, 2006. Nintendo EAD. Wind Waker. Nintendo, 2002. Nintendo EAD. Zelda II: The Adventures of Link. Nintendo, 1987.